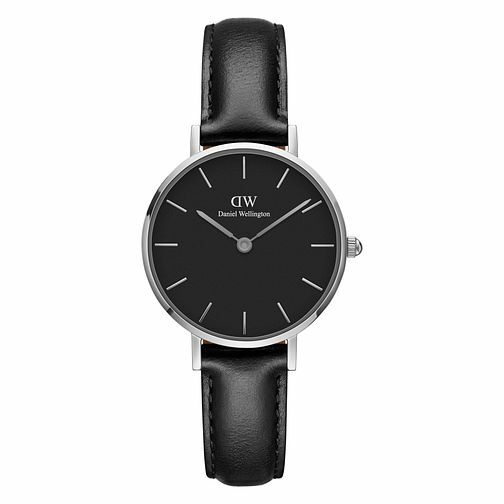 This Daniel Wellington Classic Petite ladies' watch has a simple, chic style and sophisticated black leather strap making it the perfect timepiece to wear with any outfit and for any occasion. The elegant silver stainless steel casing and bezel surround a beautifully designed black 28mm face, styled with silver hands and baton hour markers. Daniel Wellington Classic Petite Ladies' Black Leather Watch is rated 5.0 out of 5 by 1. Rated 5 out of 5 by Anonymous from Perfect but... Its perfect but just 1 set back is that the watch looks much smaller to the actual picture.